Temple Hayes is poised to join the ranks of Brene Brown, Joel Osteen and Louise Hay, and she has a running start--her spiritual home is the overflowing First Unity of St. Petersburg, Florida. Her audience is expanding quickly as her message of hope reaches the hearts of millions of restless seekers and those abandoned by mainstream churches: it's time to stop dying a bit every day and start embracing the God who created us. Hayes' unique writing style will captivate readers through her blend of Jesus's parables, Zen koans, insight from Mark Twain, Southern storytelling, and a good dose of common sense. She skillfully fills the pages with 'aha' moments that will awaken people to the realization that they're either growing or dying--as she says, when we're serving we're giving, and when we're giving we're really living. 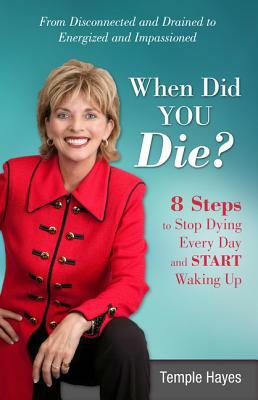 When Did You Die? is a bestseller in the making that will propel Hayes into the media spotlight as the global spiritual leader she truly is.